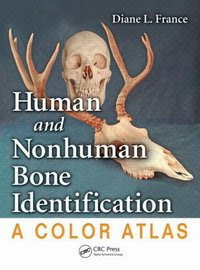 Written by one of the most respected forensic anthropologists in the world and designed for use in the laboratory or in the field, this volume is a practical comparative guide to the differences among species for nearly all bones in the body. It features high quality photographs that illustrate shape and structural distinctions by showing similar bones from various angles, highlighting the contrast between human bones and those of other species. To identify commonly confused bones, separate sections are organized by types of bone as well as by groups of species, allowing for easy access to information. This book is also available on CD-ROM. don't quit as well as keep posting seeing that it just nicely to look through it.